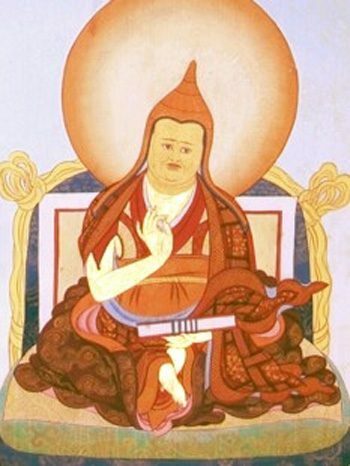 I bow to my teacher and to Manjushri, being of timeless awareness. With little difficulty, a city practitioner becomes a knowledge holder. Such is the power of this profound path. Place your mind in the natural flow of experience, don’t think about anything at all, and keep attention constant. When you do this, you may experience a dull vague knowing that is ineffective and indifferent. When no insight at all arises, no knowing of any kind, teachers call this not knowing “ignorance.” They regard it as ineffective because you don’t know how to identify or describe your experience. They also call it “routine indifference” because you have nothing to say about what you are resting in or what you are thinking about. What’s happening here is that you are resting in the ground of experience1 with ordinary casual attention. Although such methods for placing attention should give rise to non-conceptual timeless awareness, when the timeless awareness of knowing itself does not arise, you aren’t doing the actual practice. Is the genesis of confusion and ignorance. When this experience arises, there are no words or concepts to describe it. You could call it “beyond ideas,” “beyond words,” “original sheer clarity” or “awareness.” A timeless awareness arises in which you recognize what you are and it clears away the blind vague dullness. You know with certainty the pure being3 of your own mind, just as when dawn breaks you see the inside of your own home. Once you know this directly, you know that this quality of pure being is and always will be there. You know it is not something that develops from seeds and conditions. You know it does not change with time (past, present, or future). And you cannot imagine there being even an atom of a so-called mind that is something else. Because there is both a right and wrong way to understand such phrases as “ordinary knowing,” “doing nothing in mind” or “beyond expression,” you have to be clear about this crucial point: same words, higher meaning.5 When you are, you will come to an experiential understanding of the profound Dharma. While resting in the natural flow of the experience of mind itself, some people just try to stay clear and aware. They end up in mind consciousness6 thinking, “It’s so clear!” Some people hold on to an empty serenity, in which knowing seems to have gone empty. Both are holding on to subject-object experiences associated with mind consciousness. When these experiences arise, with steady continuous attention look right at the knowing of clarity and what holds on to clarity or the knowing of emptiness and what holds on to emptiness. Dig out the stake of consciousness that holds on to subject and object. When a pristine, transparent, dimensionless, empty clarity arises on its own, unshakeable, fresh and alive, that is called “awareness itself.” Free from the coverings of held experiences, awareness, timeless awareness, arises, utterly fresh and clear. By means of the natural flow and natural clarity of pure being, identify awareness —like a rice shoot — free of the husks of mind consciousness, analysis and energy surges. It’s not enough just to know how this awareness is. You need to stabilize the resting by practicing being right there. It’s very important to keep an undistracted continuity of attention when you let knowing flow naturally. As you keep doing this, waves of conditioned energy and patterns of thinking habituated from time without beginning arise with no particular rhyme or reason. Sometimes you experience unthinking thickness and sometimes, in the brilliance of insight, unthinking transparency. Sometimes bliss experiences arise with desire and sometimes without desire. Sometimes clarity experiences are accompanied by clinging and sometimes brilliant pristine clarity arises with no clinging. Sometimes unpleasant and disturbing experiences arise and sometimes pleasant and peaceful experiences arise. Sometimes meditation disintegrates because you are lost in the turmoil of out of control thinking, and sometimes you are troubled because you are thick and dull, with no sense of clarity. Whatever arises, set no goal and keep to your path, like a person on a long journey who sees both delightful and dangerous places along the way. In particular, when you are not well practiced, experiences of agitation may arise with thoughts blazing up like fire. Don’t be upset. Keep attention steady by balancing focus and relaxation and, one by one, a progression of experiences such as “attainment” will arise. At this point, in general, trust the distinctions between awareness and ignorance, ground of experience and true being, and ordinary consciousness and timeless awareness that you recognized in your own experience through your teacher’s instructions. When you practice, you should work mainly with the instruction to let pure being arise clearly on its own as timeless awareness by letting ordinary consciousness rest naturally, just as water becomes clear when it is not disturbed. Don’t reinforce conceptual thinking with theoretical speculation or by analyzing how to adjust your experience, e.g., “Is my meditation ordinary consciousness or timeless awareness?” as both peaceful resting and insight will be somewhat distorted. The practice consists of peaceful resting, the steady continuity of attention when you rest in the natural flow, and insight, knowing that recognizes its own clarity and presence, joining through their own momentum. When you stabilize this practice, knowing that is undifferentiated resting and insight, that is, timeless natural flow and natural sheer clarity — naturally present timeless awareness — an experiential understanding of Great Completion,7 will arise. Let go completely of cares and caring. Rest like a child, free from cares. This way of letting attention rest naturally and keeping to the awareness that knows what you are, that knows essence of mind or pure being, is an oral instruction that summarizes a hundred crucial points in one. This is what you keep going all the time. What is a measure of progress? Night-time sheer clarity takes hold. What are signs that you are on the right path? Faith, compassion and wisdom grow through their own momentum. How does direct experience come easily with little difficulty? You will know this through your own experience. Why is this path profound and fast? Without doubt, when you work at this practice and pour your energy into it, your direct experience will be similar to the experience of those who have engaged this or similar practices. What do you attain when you practice the sheer clarity of your own experience?10 When the spurious distortions of conceptual thinking and associated patterns have naturally cleared and the two kinds of knowing have effortlessly developed,11 you experience eternal being12 and the three dimensions13 are naturally present. For the sake of city practitioners and others who generally don’t put much effort into study and reflection but want a practice on mind nature, on the twelfth day of the second month of the Fire Horse year (April 6, 1906) Mipam Jampal Dorjé composed this practical guide to the experience of old sages using profound instructions in easily understood language. In Los Angeles, California, in September, 2010, in gratitude to Kilung Rinpoche, Ken McLeod translated this text into simple non-technical English, in keeping with Mipham’s intention. Let virtue grow.